* To promote camps, conferences, national, regional and continental meetings of the Democratic Anti-Fascist and Anti-Imperialist Youth in the world, towards the 27th IDAAC. * To begin a process of coming together among the youths of the world that we met, to lay the foundations for a permanent international platform of the Democratic, Anti-Fascist and Anti-Imperialist Youth. * To promote and participate in the 2nd Meeting of Women of Latin America and the Caribbean to be held in Quito, Ecuador, from September 28 to 30. * To proclaim August 12 as International Youth Day, as an important day to mobilize and raise the most heartfelt slogans of the youth. * In all our activities, to raise the fight against fascism and war as unitary banners. * To promote throughout the world the need to build a great Democratic Anti-Fascist and Anti-Imperialist Front, as the axis around which to unite the struggles of the youth from all over the world. * We commit ourselves to participate in and promote the initiatives of the young participants in this 26th IDAAC, and thus to contribute to strengthening each of our organizations. * To fight for the decolonization of the peoples who still in the 21st century have not achieved their freedom. * For the next September 26th, which marks 4 years since the disappearance of the 43 student teachers of Ayotzinapa, we will carry out actions in each of our countries to demand the presentation alive of the 43 students and the thousands of persons disappeared by the Mexican state. * We support the struggles of the young people that are developing on the continent and in the world; we show our solidarity with the young students of Nicaragua, who for three months have been mobilizing against the repressive policies promulgated by the government of Daniel Ortega, at the same time as we condemn the imperialist intervention because we are firm defenders of the self-determination of the peoples; we trust that the Nicaraguan working class and people will find the way to put an end to their oppression and social exploitation of which they are being targeted. The corrupt Temer and his abominable government are presenting the defense of his reforms as necessary “to save the country,” which represent real attacks on the Brazilian people. For example, the approval of the labor reform and outsourcing, which takes back historical rights of the working class, in addition to trying to put an end to public education and health care in the country, with the approval of the constitutional amendment 95 that freezes public investment in health care and education for the next 20 years, endangering the public character of schools and universities. The Brazilian youth and workers have always had, as the only way out of the crises created by the governments and the bourgeoisie, the mobilization and the struggle; that is why it is necessary to take to the streets to prevent any attempt of those who try to do away with the rights of the poorest people in order to continue to benefit the bankers and entrepreneurs. Out with Temer and the Bankers! Macri’s policy of structural adjustment and sell-out in Argentina has deepened the sufferings of the people, hunger is growing and wages are not enough, studying becomes difficult and it is becoming a challenge to finish school or a career in the university. But the people in the streets have prevented Macri from going thoroughly with his plan. This is demonstrated by social organizations such as the CCC [Class and Combative Current], CTEP [Confederation of Workers of the Popular Economy] and Barrios de Pie [Neighborhoods Standing up] that are demanding housing, land and jobs, and the workers of the Rio Santiago Shipyard who are defending their jobs and the national production. All these struggles are being affected by the green wave [the movement for legalized abortion – translator’s note] that is running through Argentina. Women, mainly young women, have been fighting to ensure that on August 8, safe and free abortion will be the law and in this way we can put an end to the clandestine practice that takes the lives of the poorest of us. We fight to unite all these struggles of the popular camp and so that, with the hegemony of the proletariat, we can seize power. To achieve national and social liberation of Argentina in an uninterrupted march to socialism. In Turkey, the neoliberal policies are forcing young people into poverty and a one-person regime is being built to implement these policies more quickly. In order to realize his dream of governing the country as a corporation, Erdoğan appointed many leaders as his ministers to carry out his attacks against the working class faster. His war policies are used to consolidate support within the country and especially to exploit the countries of the Middle East. Erdoğan and the dreams of the Turkish bourgeoisie to become the leader of the region are causing many young people to die everywhere. In addition, the economic policies of the Erdoğan governments have made Turkey increasingly dependent on all the imperialist forces. The privatization and closing of the means of production have made Turkey buy even basic consumer goods from abroad. This further clouds the future of youth. To put an end to the dissidence of the youth, chauvinism and religious arguments are often used even in education. But even that is not enough to burn the struggle of the youth in the fire, so that secondary schools and universities are reformed, student organizations are closed, students are arrested, detained or expelled even for minor protests. Academics, teachers and administrations are being replaced. The forces of the entire government are preventing the forms of struggle of the working class. Labor security does not exist. Against these policies and against the attacks on the working class and youth, we will organize masses of young people to carry out their demands for a free, dignified and humane life. We should organize the dissidence of the youth with the correct direction and theory of Marxism-Leninism and the experiences of our comrades that we learned in this camp. We will win! The proletariat will win! Death to imperialism, death to fascism! Young people of the world unite! Fascism is on the rise in the United States, bringing centuries of brutal US imperialism home to everyone in the United States. As young US Marxist-Leninists, what is at stake for our organization grows every day. The tens of millions of people who died to defeat fascism for the first time, and the thousands of children who were cruelly torn from their parents by heartless ICE agents and placed in inhumane camps, are watching all our movements in these critical moments of US history. The forces of the left in the United States should proceed with foresight, analysis and, most importantly, collective action. The future of all the young people targeted by the fascists, the LGBTQ+ community, people of color, women, Jews, students and countless others, our future, depends on our actions at this time. The future will not forgive us if we do not dismantle US fascism now before its terror completely consumes the nation. Death to fascism and US imperialism, long live the struggle of the workers and peasants, long live the struggle of the students and young people, long live the solidarity with all those who fight against fascism, imperialism and the tyranny of the bourgeoisie, all power to the workers! The United States is a nation that terrorizes the rest of the world with its militarism, neoliberal economic policies and racist, fascist and imperialist government. Our revolutionary and youth organizations are building and maintaining movements that weaken US imperialism from within so that the revolutionary struggles around the world can be realized. Thus our organizations fight for and support the liberation of those most affected by imperialism within the United States. With the increase of the attacks against the working class and the oppressed in the form of imprisonment, brutalization and poverty, US imperialism targets its own citizens. In the US, we have two political parties of war. By perpetually investing in war, our government does not invest sufficiently in social and public services for its own people. At this moment, we have an openly racist, xenophobic and fascist president who does not hide his racist perspective against communities of color, both domestically and around the world. It is time to abandon the empire and invest in sustainable development in the US and to create collaborative relationships with the rest of the world. The working class of the US has to mobilize in solidarity with the struggles against US imperialism inside and outside our borders. We totally repudiate the dictatorship imposed by the US Congress in the form of the Fiscal Control Board, for its interference in the public policy of the country. We oppose the control it exercises in the neo-liberal policy through the budget and fiscal plans, as well as through the imposition of public officials that are enemies of the workers’ sector. We denounce the harmful effects that labor reforms have on the working class and the impoverished that take back their acquired rights, the attacks against the retirement of various labor sectors, and the closing of schools brought about by the educational reform. We reject any attempt to privatize and contaminate our natural resources, basic services, and the looting of the Public University for the payment of an illegitimate and unaudited national debt. Because it will be the organized people who will take power for a free and socialist Puerto Rico. The young Filipinos swear to overthrow the US-backed regime of President Rodrigo Duterte for his fascist crimes against the people: a “war on drugs” that has killed more than 20,000 people; a war against the Muslim and indigenous communities through martial law; and attacks and assassinations for political reasons of activists and revolutionaries. We support striking workers across the country against contractualization, especially with the picket line of NutriAsia that was violently dispersed. We will fight for socialism in the Philippines as our contribution to the international anti-imperialist movement. Boycott NutriAsia! Defeat the US-Duterte regime! We young people, secondary and university students, workers, peasants, teachers, women and men who are fighting for free entry to the University and for a quality education and are fighting the corruption left us by the Correa regime, are raising a policy of demands to the government of Lenin Moreno to fulfill its campaign promises; the peoples of Ecuador reject the Moreno policy which seeks to strengthen ties with US imperialism, and which is preparing an economic adjustment packet that includes the elimination of fuel subsidies. Only organization and struggle are real guarantees of change; we young people of the world affirm the need for unity for building a more just society that responds to the interests of the peoples. The always combative and revolutionary Peruvian youth has the task of organizing and raising the consciousness of the social classes exploited by this unjust system; to fight for the organization of the youth in the countryside and in the city: in the universities, schools, factories and other areas where we have young people present, it is also one of our main tasks in our country. We also fight for the access mainly of the children of the people, of the workers and peasants to education and that it be public, free, national, scientific and democratic, that it serve for social and national liberation. We Peruvian young people repudiate the corruption that has always existed and is currently on the rise in our country, so we are in a stage where it is up to us to raise the banner of a Constituent People’s Assembly and with this, the creation of a new Magna Carta which ensures the rights of the proletariat, the peasants, the native peoples, the women, as well as the young people, to a job paid to meet the basic needs of a family, access to health care, education and above all to justice. The imposition of neoliberal measures according to the guidelines of imperialism, especially US imperialism, the merger of the “forces of order” with drug trafficking, the moving to the right of sectors of social democracy and the ideological campaigns to promote fear and demobilization; these are part of a process of fascistization that has taken place in Mexico, that is, the gradual elimination of democratic freedoms. On July 2, the masses expressed discontent with the reactionary measures of the regime. In the social movement, the idea now prevails that the coming of AMLO to the presidency will mean a turn in this increasingly aggressive tendency against the masses. Despite the expectation of democratic openness and freedom that can be found in the talk of the new government, the first steps in its political discourse regarding neoliberal reforms and the composition of the new cabinet suggest that the economic base of exploitation aggravated by neoliberalism through reforms such as of labor will not be touched, the pro-fascist law of internal security will not be eliminated and the special economic zones whose purpose is to remove the natural resources of the south of the country, will be paradises of private initiative and will even be expanded. In a few months it has been shown that the power of the new government does not lie with the masses, the very imposition of candidates within Morena was a clear example; the new political power that gives voice to AMLO is falling on those sectors of the oligarchy and the national bourgeoisie that seek to favor their interests with a different administration. In order to promote its Keynesian model and provide continuity, it will require renewing the bureaucratic apparatus of the PRI with measures such as the decentralization of federal dependencies and it will seek to coopt and corporatize the mass organizations through the use of public resources. The position of the new government forces us to strengthen the consciousness of the masses at this stage, so that they take to the streets and do not cease their demands, because today only on the millions of proletarians of the country depends a true turn from the trend toward fascism and to break the chains of imperialism that bind the people. 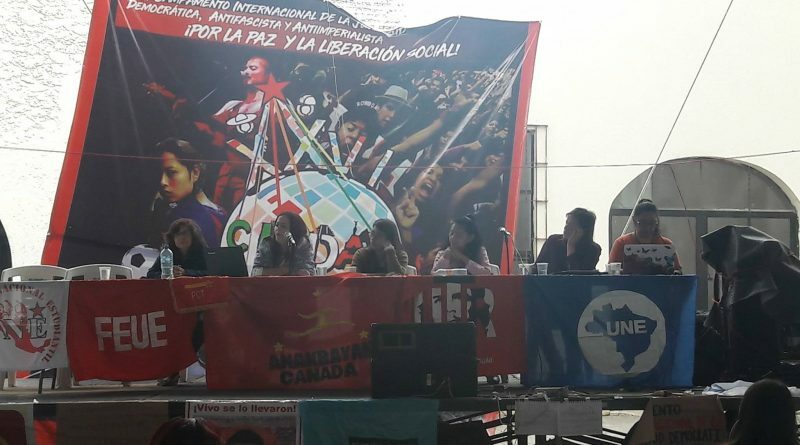 The youth have an important revolutionary potential; today they are rising in the country with the banner of unity, as the hundreds of young people gathered in the 26th International Anti-Fascist and Anti-Imperialist Democratic Youth Camp show. They are a decisive step to raise the slogan of Change now! We know that today there are millions of young people who are more willing to fight, but today we are raising an anti-fascist and anti-imperialist platform with the most advanced sectors of youth, from which we can push forward an advanced position in education, work, culture and the social change.